Flying in from different continents, three friends met in blustery Winnipeg, in central Canada. Anjali Singh, a mother of six-year-old twins, heads Gabriel India (an auto parts manufacturing company), is the creative director of Sujan Luxury (a trio of wilderness camps in Rajasthan) and is a brilliant photographer who doesn’t miss a trick. Anjali had planned this trip, and flown from Delhi. Tara Lal arrived from London where she recently finished her degree in conservation science at Imperial College. She’s been involved in releasing cheetahs in the Mapesu Private Game Reserve in South Africa, where she is an investor, and has monitored wild dogs in Botswana. She’s an ardent traveller and a superbly talented photographer. I’m a travel writer and columnist. I’ve also written and illustrated several children’s books and am always on the lookout for adventures such as this. I’d made my way from New York, although London is just as much our base. 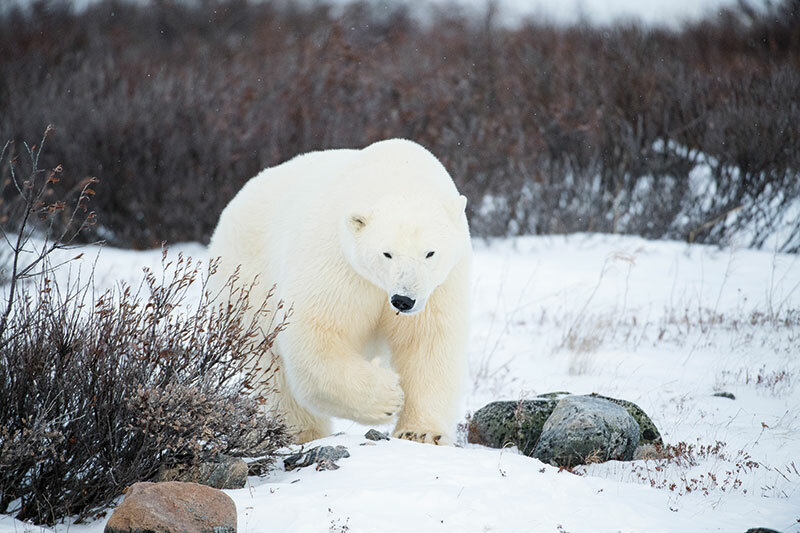 Anjali, Tara and I are ardent wildlife lovers, and we’d come to see the wilderness of subarctic Canada and experience a rare phenomenon possible only with the company Churchill Wild at their lodges: engaging with wild polar bears on foot. Our passions were aligned, our anticipation keen, and all three of us were excited to be spending time with each other, so it mattered little that the journey was arduous, or the baggage allowance too meagre, or that we were ‘tripling it’ in a single room. 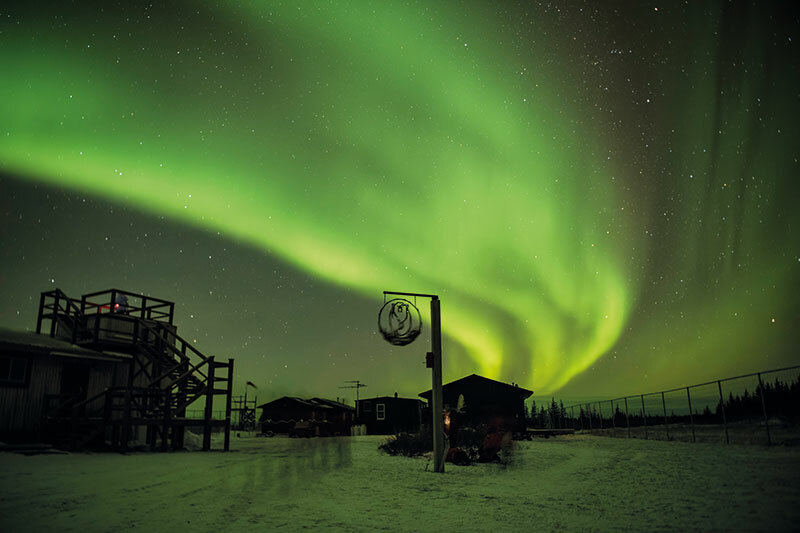 The Reimers, who own Churchill Wild, run several lodges, and their Hudson Bay season mostly lasts from mid-June till mid-November. 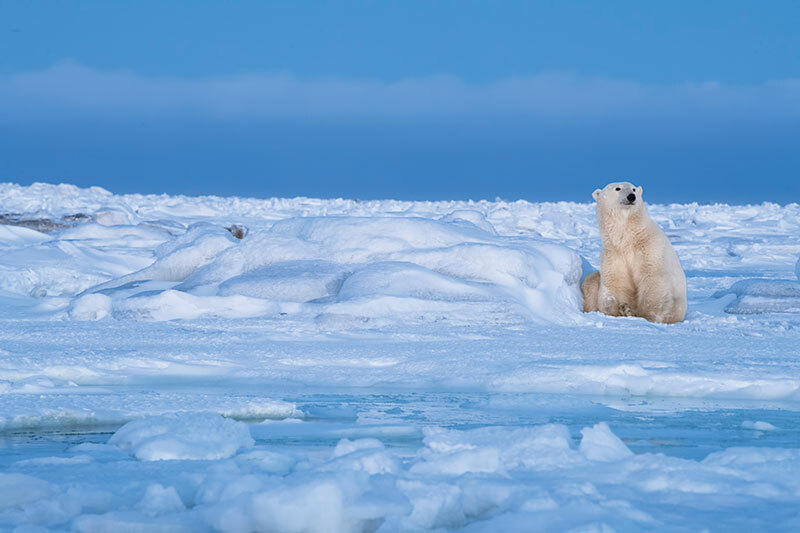 The bears can be seen right from the time they come off the melting sea ice in the summer in July (they rest, jostle and wander about in a state of walking hibernation) till the waters freeze again and they head off to hunt seals. Ringed seals are their main source of food, and since they’re too agile in open water, the bears have perfected the art of hunting them and their pups on the ice that forms each year. 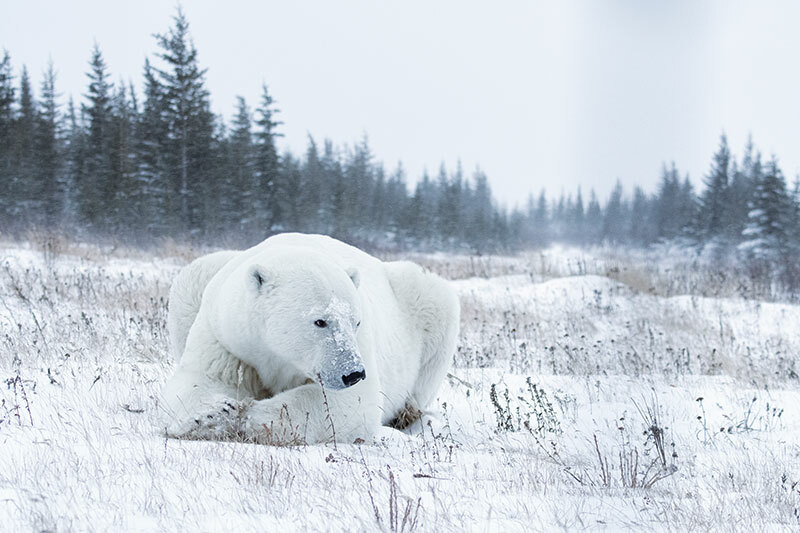 Anjali had chosen November to photograph polar bears in their natural and preferred habitat of the snow and ice, rather than the grass, flowers and bees of a summer. We’d planned for cold weather, but we had no idea just how extreme it would turn out to be. At the Grand Hotel Winnipeg, we were briefed and fitted into waterproof overalls, heavy jackets and boots. We had to laugh, as we looked like ridiculous blimps, all puffed-up! The inner layers, heat pads, gloves, balaclavas and goggles were yet to be added. Last year, it was 5 degrees Celsius on November 5th, but now, snowstorms had arrived early, and just the ambient temperature was minus 28 degrees! We were going to be outdoors for the most part, and the wind would whip up its devilry, just to show us who’s boss. Early next morning we flew two hours on Air Canada to the tiny town of Churchill at the edge of the enormous Hudson Bay. 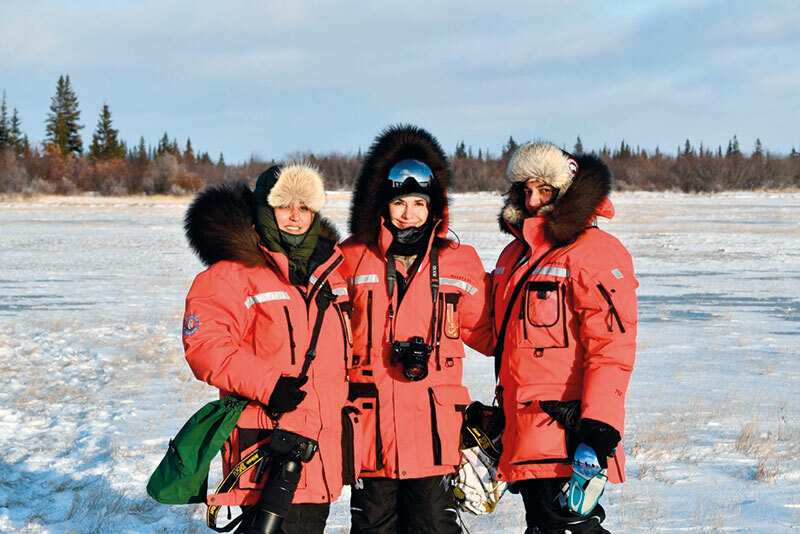 Wearing polar gear and hearing announcements in Inuktituk, the language of the Inuit, roused that feeling of adventure at the edge of the world. Churchill Airport was abuzz with groups of people coming and going to the Churchill Wild lodges and we listened eagerly to reports from Nanuk Polar Bear Lodge and Seal River Heritage Lodge, where we were heading. Jason, our jaunty pilot seemed alarmingly young. “He’s 12!” said Tara with a glint as we clambered into our 11-seater Twin Otter sitting just behind him. Perhaps our enthusiasm infected Jason, for he flew low — just 70 metres above ground — and spotted for us as we flew south for 45 minutes to the lodges. The sun was just budding through the clouds and below us, on the left, was the ice-covered Hudson Bay, and, on the right, was a vast open flat white snow-laden landscape, etched with dark, leafless spruce trees. The landscape instantly reminded me of the Serengeti plains of Tanzania, and the notion of seeing species new to me was exciting. ‘Serengeti’ means ‘the land that runs forever’ and these flatlands too stretched to infinity. It was a real wilderness without a trace of mankind. Each year 30,000 caribou migrate through here, and when they run, the earth vibrates with the thunder of their hoofs. A vast variety of wildlife thrives here; enormous herds of moose, packs of wolves, red foxes, black bears, wolverines, lemmings and vast flocks of nesting birds. 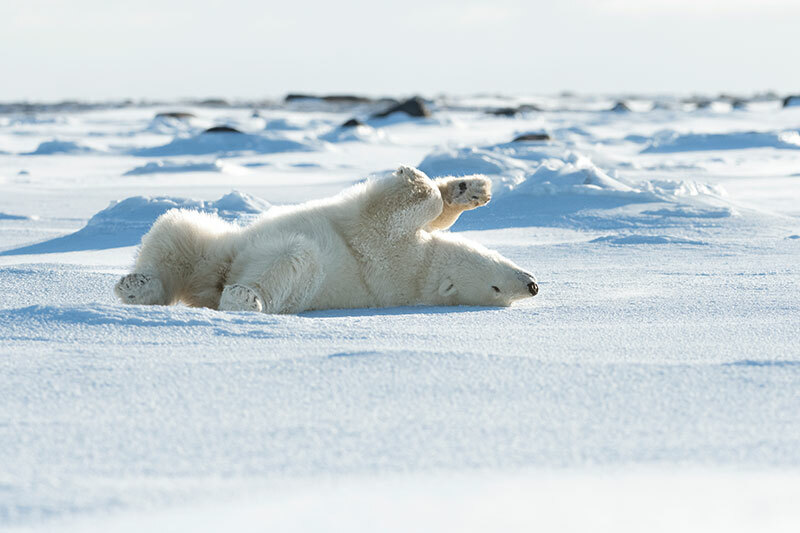 I’d read descriptions of scenes on the sea ice that were reminiscent of Africa’s great plains; where a lion or a polar bear hunts down its prey — a seal or a walrus. 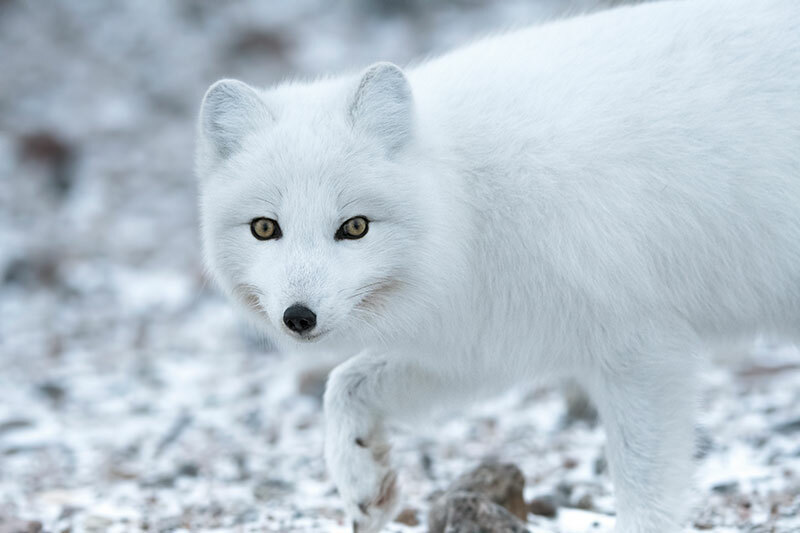 Scavengers arrive swiftly — arctic foxes edge up like hyenas and jackals, snatching a bite every chance they get. Then come the ravens, swooping in like vultures, picking at scraps and finishing off everything the bear left behind. I peered through the window to where the water meets the shoreline, and a butter-coloured trio of a mother cuddling her two cubs set my heart pounding. The sight barely registered when Jason tipped right and called out a large male walking north. He padded on, unperturbed. To the left, a sub adult ran from the sound of the plane, the sunlight catching the snow dust he kicked up. Over and over again Jason anticipated bears from their tracks. They were all heading north, behind us, to the points where the river meets the sea. Freshwater freezes first, and having fasted all summer, they couldn’t get to those seals fast enough. We spotted a magnificent grey wolf with his ears pricked and feet firmly planted — and if there is a single second that can burn into one’s mind, it was this for me. His gaze pierced through me, as though I’d been singled out for the hunt. The count had gone to something like 26 bears when the descent started. All along, Anjali’s 400-mm lens was pointing downward, and I saw her sorcery in action. She’d anticipate, spot and capture bear expressions in mid-frame right as they glanced up. The plane landed right in front of the remote, eight-room, wooden lodge. It stood alone but resolute, hundreds of miles from the nearest road. Our only connection to the outside world was Jason, and he’d just taken off in a whirl of snow. My woolies were in my luggage and I felt as though I was going to perish. I took my numb hands and feet indoors so they could come back to life. The lodge was a cosy, homey affair with roaring fires and a big, welcoming lounge. Through the large windows we could see the bay in front and spot flocks of snow-white ptarmigans and a herd of moose in the tangle of willow. We soon learned to don innumerable layers, cover every inch of skin and refrain from breathing into ski goggles to avoid fogginess. In order to beat the enemy, we had to think like the enemy, and we covered every crevasse the wind could slip into. On our first game drive, when we were miserably cold, sitting high up on the rhino, we ventured full on into a screaming blizzard and experienced a whiteout. Our guide ploughed on, and we teetered on frozen rivers and sunk into crunchy ice plains. And then our reward revealed himself, and we had an ethereal sighting of an ivory-coloured bear, pacing back and forth, his nose whiffing us from a long way away, behind a veil of falling snow. The fresh air and long walks through the woods led to keen anticipation of mealtimes, and everything tasted sublime. Wild oat porridge, fluffy scrambled eggs and delectable pancakes with local berry compotes were served at breakfast and for lunch and dinner we had warming soups, inspired salads, polenta, and delicious dishes of lamb, chicken and beans. Jubilant, a dozen of us crunched through the snow in silence along with three guides armed with more jokes than bear deterrents. Derek said, “I’ve never had to use my 12-gauge gun; my voice and strong body language is enough to keep bears at bay, and at the most, smacking two rocks together is enough to send them packing.” Still, stories of polar bears stalking and hunting down humans, breaking into tents and mauling their victims ran through my mind. The Inuit and the bear have long dined on each other — it’s been fair game. So why were we excited and not petrified? I looked back at my friends — they were calmly crunching the snow, hauling heavy cameras and unwieldy tripods on their shoulders as though they were going to film some birds or the sunset. This is why we’d come all the way — to see a piece of magic unfold. The bears here don’t fear people, as they haven’t been hunted for decades. They’ve merely been observed, given their space and left unstressed. Our bear was flat on his belly, and he was enormous. We approached in silence. Each time he lifted his head, we stopped, and soon as he put it back on his paws again, we advanced. The guides recognised him. This was Sumo, a relaxed, curious bear. We were now within 20 metres of him, and what happened next was incredible. Sumo began stretching and rolling. He slithered on his tummy, turned and pushed his legs up into the air. There were peals of delighted laughter from us. And when he stood up, we sensed his great bulk and power. He began walking straight towards us to a steady roar of camera clicks. He was barely 10 metres away when Derek and the two guides stepped forward confidently. “Good morning, Mr Bear! Don’t you look handsome today!” he said, then, pointing to us, “There’s that hunk of meat you ordered. Which one of them takes your fancy today?” This was enough to stop all 1,200 pounds of Sumo in his tracks. We were asked to slowly shuffle back several metres, to create some more distance. There was nothing predatory about Sumo. He sniffed the area where we’d stood and then faced us again, flopped on his belly and began slithering closer on his chest in the most comical manner. I’d never experienced anything like this, and certainly not in the Serengeti, where getting off the jeep is out of bounds, let alone approaching a lion or leopard on foot. Derek spoke to him again, and this time Sumo stopped, stood up and walked away. We were in awe. In this small corner of the world, a handful of people figured out that these bears are not aggressive, just curious, and there is a way to get up close to one that’s relaxed. There’s never been an untoward incident, and it was a privilege to witness this incredible trust. Tara was desperately keen to see wolves as well, and in our last hour we were summoned to the watchtower to a stirring sight. In the far distance, over two dozen wolves, black, grey and tan, were bounding towards the lodge. 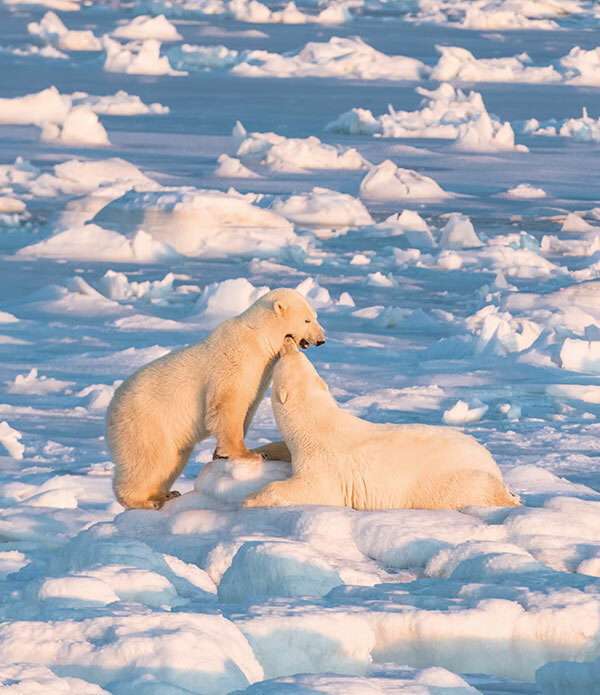 The next leg of our journey took us via Churchill to Seal River Heritage Lodge, further north in the treeless tundra, where, upon our arrival, we saw a pair of female bears playing rough and tumble between the icy hummocks and pressure ridges that edge the bay. Later, they circled the lodge, whiffing at the kitchen smells. We watched them up close through the giant windows, and I could have rubbed noses with one when she stood up tall on her hind legs to peer inside. 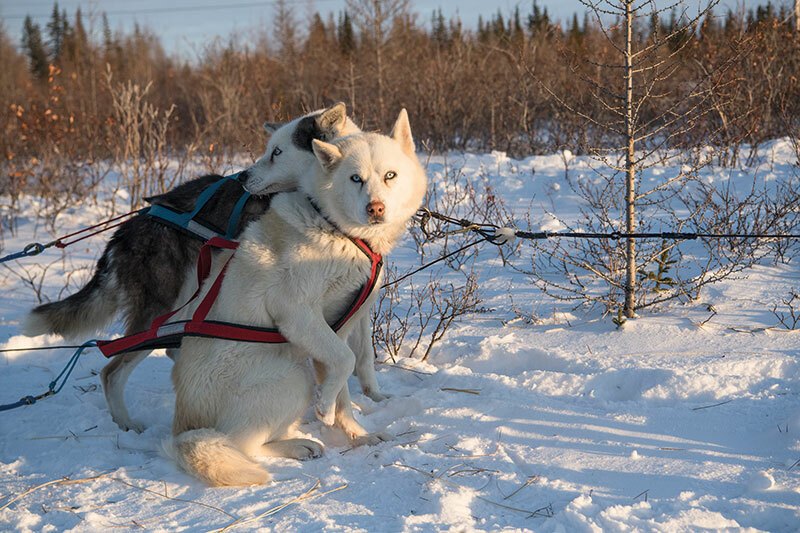 The constant antics of a dozen hyperactive arctic foxes had us enthralled. Over the next four days, Andy McPherson, the deeply knowledgeable head guide, walked us across stunning ice formations and frozen lakes. 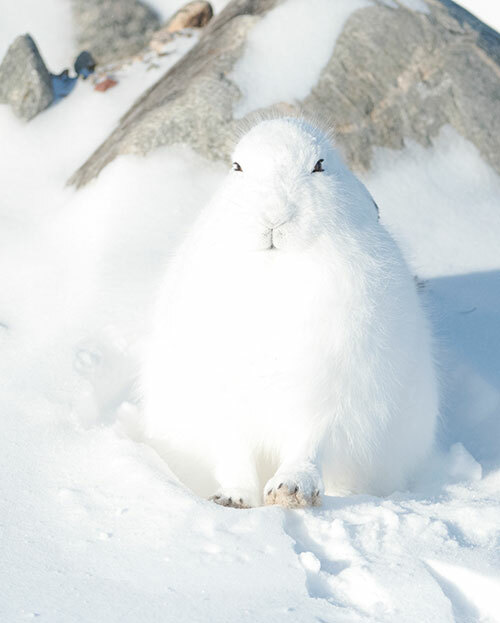 We saw a magnificent snowy owl take flight, flocks of constantly feeding ptarmigans, more arctic foxes, a lone wolf, unflappable arctic hares and more polar bears. Here too, we stood still as they walked right up to us, then turned away when Andy and the guides took charge. Having fallen in love with these bears, their predicament felt all the more poignant. 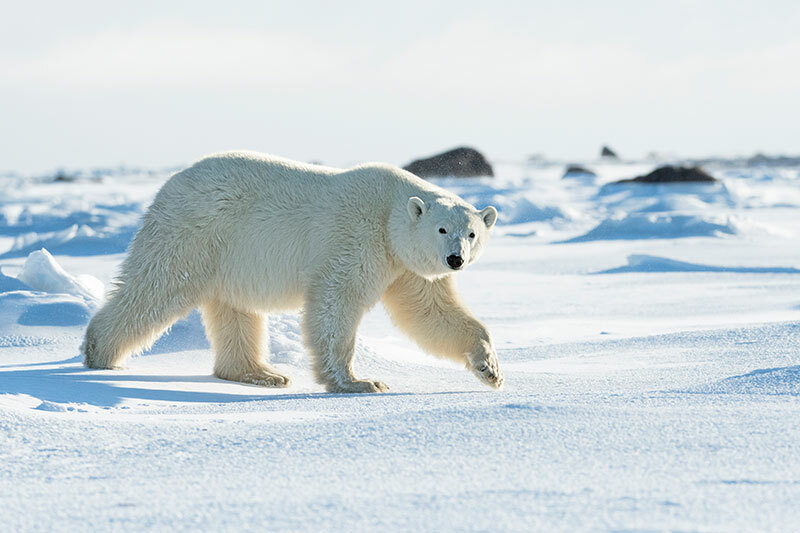 Although they are ‘threatened’ and not ‘endangered’, they are specialised, niche hunters and a one-time serious delay in the formation of sea ice is all it will take for them to starve. This year, thankfully, the hunting grounds had opened early. Unlike the Serengeti, there were no calls of wild animals in the middle of the night, but there was something that woke us up. Something compelling that made us shake off our stupor and go through that layering ritual — the northern lights. An invisible, moving paintbrush dipped in bright green splashed the black canvas of the sky. Every now and then there were hints of purple and pink. We watched, mesmerised. And when the chilly, wild air came to take a bite, we didn’t even notice. How to get there…. 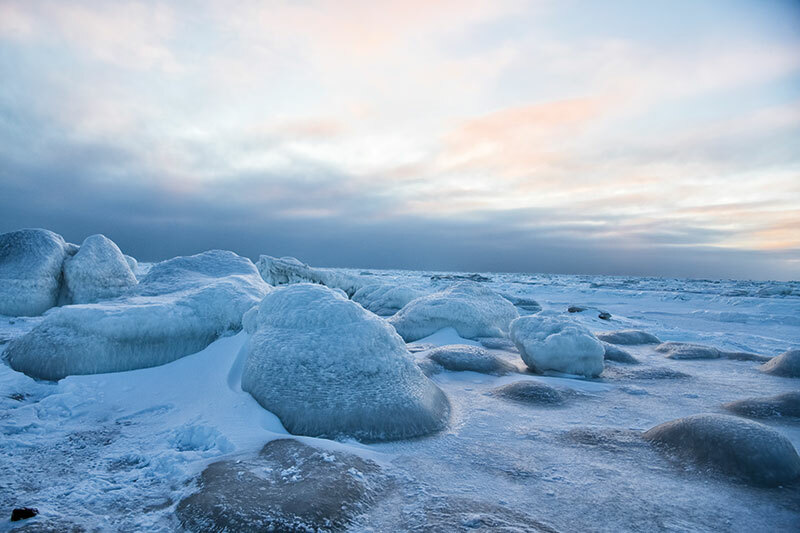 Fly to Winnipeg, Canada and take a two-hour Calm Air flight to the town of Churchill by the western Hudson Bay. From there, your host Churchill Wild will take over. Where to stay…. We stayed four nights each at Nanuk Polar Bear Lodge and Seal River Heritage Lodge, with a night in between in the town of Churchill. What to pack…. Churchill Wild mainly operates in summer and autumn, and a few weeks of the winter when it gets really cold. Dress according to the season. Heavy winter gear and boots can be rented from Churchill Wild.